The ApMtn team took a field trip to Montreal a few weeks back, and expected to return with lists of franglais-flavored baby names. As it turned out, most names were simply French. Or English. But we did find ourselves appreciating the assistance of our oh-so charmant concierge. And so we’ve decided to use his appellation here. With the Jolie-Pitts opting for French flavored choices for their two newest, it seems only appropriate that today’s Name of the Day is Etienne. 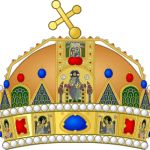 Etienne is the French form of Stephen, a name worn by kings and popes. Saint Stephen was the very first martyr, and his feast day is December 26 – familiar to anyone who’s ever carrolled Good King Wenceslas at the holidays. 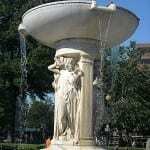 Pronounced ey TYEN or ay TYEN, it’s not the easiest sound for an English speaker to master. There’s a tendency to give it three syllables – ey TEE ehn – which isn’t quite right. In France, the name hovers just outside the Top 100, ranking #122 in 2006. Among the Quebecois, where we found our Etienne, it’s quite popular, coming in at #27. It’s big on the map. At least six dozen Saint Etiennes can be found throughout France, from tiny villages to the capital of the Loire. While he sounds a bit exotic, Etienne has been in nearly constant use throughout history – just not in the US, where he’s never cracked the Top 1000 given names. Steven, a Top 25 choice for many years, today stands at #97, with variant spelling Stephen coming in at #172. The German, Scandinavian and Eastern Europe Stefan hovers just inside the rankings at #941. 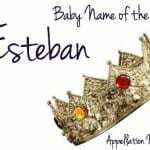 The Latino versions of the name seem more accessible and current – Esteban ranked #356 and Estevan #900 in 2007. While we think there’s much to love about Etienne, and it’s easy to see that French-inspired monikers may well become fashionable once more, many of these names feel a smidge pretentious – especially on a son. For those of us addicted to Bravo, we all know the response that Alex McCord on Real Housewives of New York City got to her sons’ names – Johan and François. So it doesn’t seem likely that you’ll stumble across a small Etienne at Playhouse Disney LIVE! On Tour or watching the monkeys at the local zoo, we’re curious to see if French names do experience a revival – and if so, if classics like Etienne are part of the trend. I don’t know about people with Etienne for a first name but its been my family’s last name forever! Glad to see this thread on the name Etienne! We are considering this name for our son and like others love the name but are unsure about the issues around pronunciation (BTW you can go to Dictionary.com to hear the pronunciation). Two different people immediately thought it sounded like “ATM,” although we imagine that ATMs will soon be obsolete. We are also considering Lionel (three syllable pronunciation w/Leo for short) and Avery. Our girls are Delphine and Beatrix, so we need a boy name that’s somewhat unusual and preferably french for family heritage. Well … a girl can be named Fred. It doesn’t change her gender, but it doesn’t change the majority opinion regarding Fred, either. I’m sorry you’ve struggled with your name. I think Etienne is a beautiful name for a girl. Unique, feminine and just lovely. If I have another girl I would like very much to name her Etienne. It feels so good to say. I have a Leia (lay-uh) and a Django (d is silent). I love my kids names for they are the only kids in their school with those names. I hope you grow to love your name. I do!! Is there a female variant of this name? Sara, that’s a good question. As far as I know, Stephanie is the female version of Stephen in French. Estienne was a medieval French version of Etienne – but I won’t guess how it was pronounced. Estienne is pronounced the same as Ètienne. When the French simplified their language they replaced the Es for È. We have a darling little Etienne and I was very nervous about using it also! But we were daring and am now so glad we did. We’re Australian so it’s quite rare here….although it’s been well received! In the event he doesn’t like it growing up, his middle name is William..so he could go with that! We call our little man Eti also. I was wondering how a french person would shorten the name though? My nick name growing up was ete…. pronounced eh-teh. I have read all of the responses to the name Etienne. I originally googled my name to see any other history that comes with it, just being curious. I do love my name even though people do not know how to pronounce it. Through my life I have used my name as an obvious ice-breaker. Etty – what a great nickname! The Etienne I met was quite dashing. I’m sure your little guy is a charmer. Only trouble is, how will you ever follow up that choice? Our little boy is called Etienne, and it really suits him. we call him Etty for short. My husband always loved the name and it so beautiful I could not resist. We live in London and have not met another Etienne yet? Hmmm … I agree with you that lopping off the last “ne” to get Etien doesn’t do much for the name. The tricky thing about softer boys’ names is that it depends on both the community you call home *and* your son’s personality. When my son Alexei was born, I had the same worries. My husband’s more Frasier Crane than Indiana Jones, and I’m not exactly a jock. By some fluke, we managed to produce an athletic, big-for-his-age boy. The fact that his name is a bit on the feminine side has turned out to be a non-issue, but we figured he could always be Alex if it bothered him. On the other hand, a friend of ours named her son Avery. She’s an absolute Amazon – tall, athletic, strong – and her husband is the sporty type, too. But our kids were apparently switched at birth, as their son turned out slight and serious, and very small for his age. If most kids on your block are called Jayden and Jacob, then Etienne might be going too far. But if you live in a melting pot like we do – Hazel, Kai, Keiko (nope, she’s not Japanese), Ronan and Seamus are all in our ‘hood – odds are that Etienne would never notice that his name wasn’t “normal.” And with more boys called Elijah and Noah, Isaiah and Ezra, Sebastian and Julian, I’m not sure it’s as much of an issue as it once could’ve been. What else is on your short list? This is timely. We are having a boy and were discussing baby names a few days ago – Etienne is far and away my husband’s first choice, though he wants to spell it Etien, thinking the -nne ending is feminine. He’s the French, but everything I am finding online has me convinced that there’s no reason to mess with the spelling except to be creative, and I’m not a fan of that. I’m still not sure this kid won’t get beaten up outside our small French-speaking community for having a girly name. And not sure that removing two letters would change that. Huh. Etienne is faring better than I thought! The concierge at our hotel really was just the sweetest, most helpful and most delightfully Quebecois creature. He tipped us off to the Yves St. Laurent retrospective at the museum – the rare exhibition that pleased me *and* my (fabulous, but) short-attention-span mother. And Kayt, thanks for adding in the Haitian curve. As I was about to post, I found myself thinking that all the French-speaking Africans probably say this differently, too – but I didn’t have a minute to track down a French-speaking African (rather easily done in my neighborhood, actually) and ask. If I can bring it up without sounding like a crazy person I plan to inquire and report back. I went to school with a guy named Etienne. He was Haitian, and said his name eh-TEE-en(eh)with that last ‘e’ kind of said, kind of not, if that makes sense. I don’t love it, but I would love to hear it over Aiden or Jacob. I immediately think of the brand of shoes my mom likes, Etienne Aigner. The pronunciation factor immediately makes me scrap this on, as even reading the phonetic explanation I’m still not sure I’m pronouncing it correctly. It might be nice for someone who has a strong French background or connection, but not for my standard American mutt family. Oh, Etienne! I absolutlely love him. He honors my brother (a miserable Steven [rather’d be a Stephen] ) and sounds pretty great with my Scots surname that’s thankfully dying down as a girl name. I think the only reason Etienne gets a backburner spot (despite the fact that he honors and goes with my surname) is that pretentious feel. But I think he’s smart & snappy, handsome and a touch preppy, even. I am thoroughly charmed by Etienne and would love to see him start being used! Oh I love Etienne! I first heard of this name in my Canadian history class, don’t quite remember whom it was though. I like the exotic and softer feel of the name, (like I said, I have a thing for softer boys’ names). This is an awesome name, but without any French blood, I don’t think it’s one I can use. Still a great name overall!